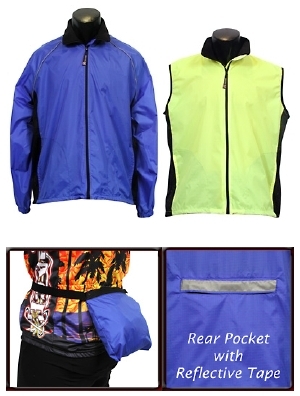 Pace Sportswear has designed a technical and safety conscious Jacket & Vest. Windstop Nylon was specially developed to stop the wind and repel water. The outside protects against the wind and water, the inside features a special coating to prevent the fabric from sticking to your skin. The Raglan Sleeve Jacket incorporates reflective piping and both have reflective tape across the back with a dual purpose rear pocket; for storage or to fold garment into a fanny pack. Equipped with mesh side panels, fleece lined collar, two front pockets, and drawstring elastic waist with cord-lock.